When we moved to Colorado in late August last year, one thing I knew I would miss in Kansas was the beautiful Flint Hills. I loved it in the spring when the ranchers burned off the grasses – the smell always signalled spring to me. A short time after the burns, the grass comes up and covers the hills with a velvet covering. A few weeks after that, and wildflowers spring forth everywhere. Last June, in one day, I identified over 30 different species in bloom near Alma, Kansas. That was a day I won’t soon forget. By mid-June, the grasses are getting lush and tall, swaying in the ever-present winds. Fall brings brightly colored sumac, brilliant blue skies, dried grasses in every shade of rust, brown and amber you can dream of, and golden cottonwood leaves in the washes and near waterways. By far, though, my favorite time was early June: wildflower season. I lamented that I would likely not see such displays of blooms ever again. I didn’t expect the high desert around Grand Junction to yield much in the way of wildflowers. Yes, we had been here in late May and there were signs of a few wildflowers, but I certainly wasn’t anticipating multitudes of blooms. My eyes have been opened! The high desert has tons of wildflowers. Sometimes they are harder to see, but they are here. In very late March and early April, a couple of short hikes up in the Monument (that’s Colorado National Monument to you non-locals) revealed at least a dozen varieties: wooly milkvetch, wild alyssum, bladderpod, elegant thelopody, indian paintbrush, golden corydalis, yellow-eye cryptantha, bur buttercup, fendler’s spring parsley, western wallflower, and a couple I still haven’t identified. On April 16 I took another short hike in the Monument and saw long-leaf phlox, yellow-eye cryptantha, wooly milkvetch, yellow cryptantha, indian paintbrush, puccoon, globe mallow, easter daisy, western tansy mustard, western wallflower, and another couple I couldn’t figure out. My May 8 hike found sand verbena (smells SO good! ), indian paintbrush, claret cup cacti, peppergrass, evening primrose, dwarf primrose, desert phlox, perky Sue, yellow-eye cryptanth, desert phacelia, fendler’s spring parsley, larkspur and western tansy mustard. During the wildflower walk I attended on Saturday, we saw fendler’s spring parsley, sand aster, spreading fleabane, perky Sue, cryptantha (yellow AND white, but no yellow-eye), prince’s plume, claret cup cacti, twin bladderpod, peppergrass, sego lilly, crescent milkvetch, large-flowered breadroot, globe mallow, sand verbena, evening primrose, desert phlox, cushion wild buckwheat, bladderstem, indian paintbrush, and bluestem penstemon. Later that day while hiking in Rough Canyon, I also saw scarlet gillia. Anyone who says the desert is lifeless has obviously not been here at the right time. With winter now in full swing, I long for summer’s warmth and color. Going through my library of wildflower images is a nice diversion at this time of the year. Thus, another installment in my “Wild Thing!” series is born. Cobaea penstemon is also known as showy beardtongue and wild foxglove, though it is unrelated to the true European foxglove. It is in the scrophulariaceae (figwort) family which is the same family as snapdragons. In Kansas, it is found in the east 2/3 of the state, but its range goes north and east to Ohio and south as far as Texas. It favors sandy, rocky hillsides and especially limestone outcrops. It grows from 6 to 40 inches in height with strong stems that bear clusters of 2-6 blooms that range in color from white or pinkish to pale lavender. The throats have prominent magenta or violet lines. It normally blooms in May and June, and the plants may be 2 or 3 years old before they produce blooms. The first time I ever saw these exquisite blooms was two years ago while hiking at Wilson Lake. We walked into this area (pictured above) that had dozens of these beautiful flowers, gently swaying in the breeze. 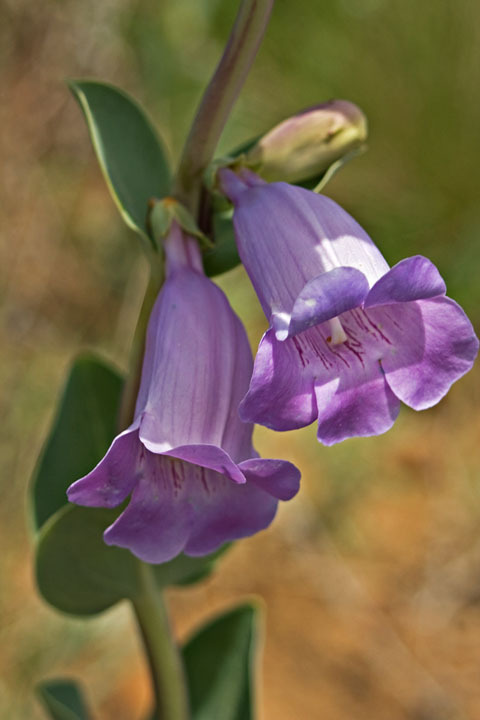 The blooms are bell-shaped and very graceful and elegant. The purple stripes around the throat are beautiful, and the details inside are amazing. 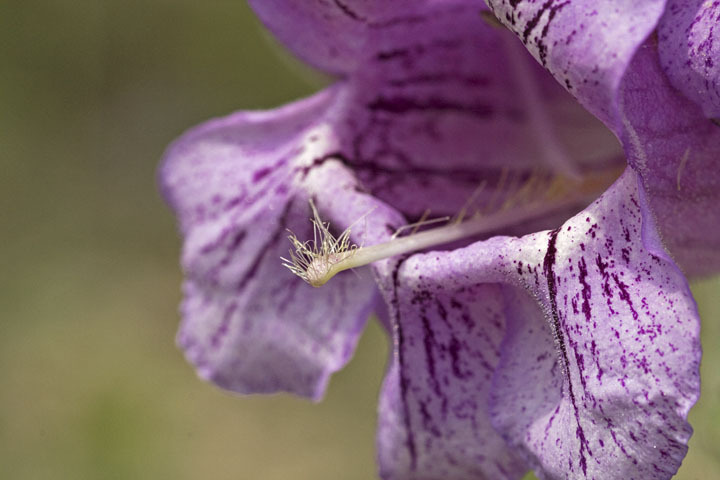 In this close-up, you can see why it is called a “beardtongue.” Look at the fuzzy stamen protruding from the throat. Cobaea penstemon is closely related to another prairie penstemon, Buckley’s penstemon, that blooms around the same time. 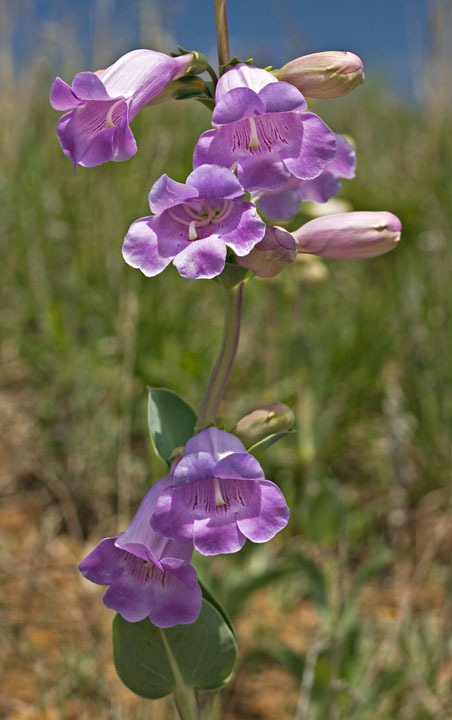 The blooms of Buckley’s penstemon are not as showy or as large, being more elongated in shape than bell-like. It is a perennial, and livestock will quickly eat new growth. The blooms are also a larval host for the dotted checkerspot butterfly, and attract other various butterflies and moths with its sweet nectar. If you have any facts or information to share about this Wild Thing!, please feel free to post a comment. I would like my posts to be both informative and entertaining, and any feedback is always appreciated. This is the first installment of my “Wild Thing!” series. I will showcase a different wildflower each time, going more in depth with facts and information. At this time, many will be Kansas wildflowers, but as I add to my portfolio, wildflowers from Colorado and Utah will also be featured. 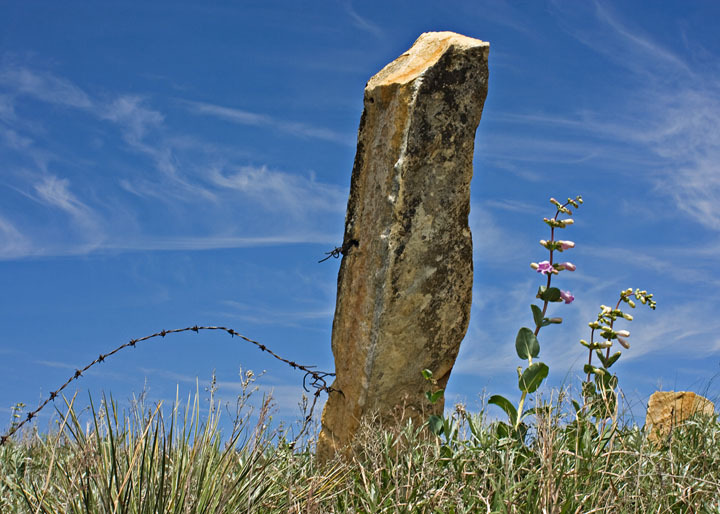 People may not think of Kansas as a wildflower/plant hot spot, but due to its varied terrain, over 600 species of wildflowers, grasses, sedges, rushes, trees and other woody plants call Kansas home. The first “Wild Thing!” I want to share is one of my favorite early-bloomers on the Kansas prairie: plains wild indigo or long-bracted wild indigo. Scientific name: baptisia bracteata. 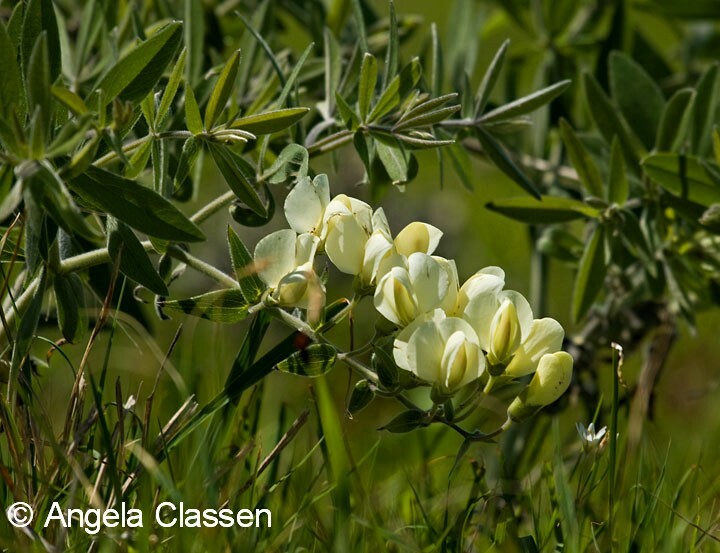 The plains wild indigo is one of the first bloomers I notice on the prairie because it starts blooming in late April or early May, shortly after the pastures are burned. When I see these flowers, I know the big show isn’t far away! They are very easy to spot because of their distinct, mounding shape. They grow 8-30 inches in height, with the long flower stems growing downward in a drooping characteristic as shown here. They bloom early because as the grass height increases, it decreases the chances for pollination as the grass would cover the blooms. I shot this one in a pasture in Chase Co., Kansas, a few miles west of the Chase Co. Fishing Lake in early May 2010. As you can see, the grass is still quite short, allowing the blooms to have plenty of attention from hungry bees. The plains wild indigo is a member of the bean family (Fabaceae), which all share pea-like flowers. It is closely related to the blue wild indigo, which blooms a little later. 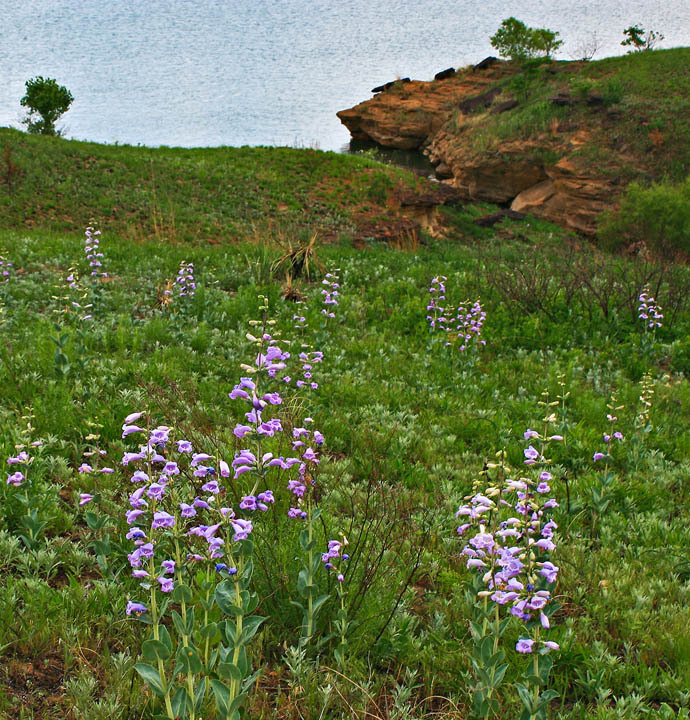 The plains wild indigo has “fuzzy” foliage, whereas the blue wild indigo does not. 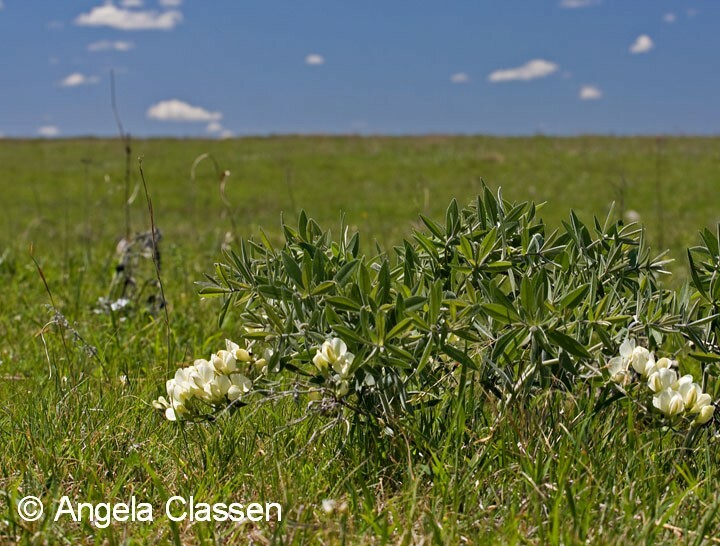 In Kansas, the plains wild indigo is found primarily in the eastern half of the state on sandy or rocky prairies, pastures and roadsides. Their range extends from eastern Nebraska and southeastern Minnesota south and eastward to western Indiana and Kentucky. The roots can grow to an incredible six feet long, so they are fairly drought tolerant. If eaten in large quantities, the foliage of the young plants can be toxic to livestock. The plants produce seed pods which turn brown or black and rattle in the wind. Bees love all members of the indigo family and visit the showy blossoms frequently to feed. Another insect that favors indigo plants is the wild indigo duskywing, a butterfly which lays its eggs on the plant. It is believed the butterflies use these plants because the mild toxicity of the foliage makes them less attractive to eat, thus protecting the butterfly’s caterpillars from predators. It amazes me how creatures know these things and use them to their advantage in order to survive. The Pawnee indians used plains wild indigo to treat colic by rubbing a mixture of pulverized indigo seeds and bison fat on the abdomen.